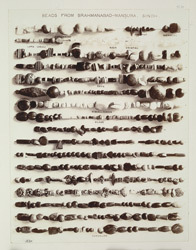 Photograph of beads from Brahmanabad in the Hyderabad District of Sind in Pakistan, taken by Henry Cousens in 1896-7. Henry Cousens wrote in Brahmanabad-Mansura in Sind, Archaeological Survey of India, Annual Report 1903-04, "Beads are found scattered about the ruins, but, excepting in one case, we did not find them in quanties together. In this one case we found about a pound of glass beads, much like the common, old-fashioned English glass bead, made by breaking up glass tubes into short sections. In Plate XLIX [this image], eight of these are seen in the row of glass beads to the right of the centre. They are very much decayed and have, of course, lost their glazed surface. But more often found than glass are those manufactured from cornelian, chalcedony, amethystine quartz, haematite, rock crystal, and onyx, and with these stones each bead had to be cut, polished, and drilled separately. These were made locally, for at Depar Ghangro we found the site of several lapidaries' houses where we scraped together several baskets full of chips of all these kinds of stones, and many of them undrilled and unfinished. They were made of all sizes and shapes...Many of the cornelian beads, which vary in colour from a pinkish straw colour to a deep red, are figured on the surface with some white pigment, which appears to have been burnt in, and cannot be moved by scraping with a pen-knife. The designs drawn are very simple, being for the most part, plain lines, little circles or zigzags. No letters or writing appear on any of these, but we found one little cornelian seal with Kufic or Arabic letters incised upon the surface."